Unlike the prior few years, I decided to take a longer break from the ultra distance events over the winter. No Death Valley Double, no Solvang Double, not even a Davis Double. I had already decided no more Devil Mountain Doubles. Although an extended period of lower activity can help prevent burnout, starting in May, I realized I needed to increase my training for the Hoodoo 500 event that is scheduled at the end of August. Training plans for these type of events are not easily found. In 2007 I attempted to do the Devil Mountain Double for the first time, but that was right after running the Boston Marathon. 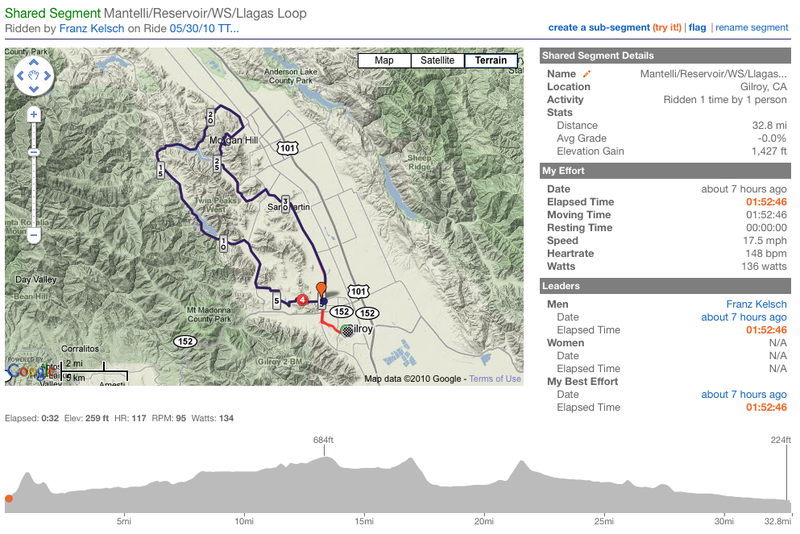 Although I finished, I realized I needed a cycling specific training plan, so I developed one for the Furnace Creek 508 in 2007 and refined for subsequent major challenges. The older I become, the more I need to have a good training program and need to track my progress against my plan. It not only helps me to properly prepare but also gives me the confidence to finish and so far I have been able avoid the dreaded DNF (did not finish). I learned from running marathons that you can not just go out and run a bunch of miles and expect to do well. Although total mileage may be one factor, it is not the only factor and not even the most important factor. When I studied marathon training I realized that there is something called junk miles, those are the miles that you run just to get your total mileage up. When training to run a marathon with the hopes of qualifying to run the Boston Marathon, I actually reduced my weekly mileage. Instead I added in speed work and also the long weekly runs at a faster pace. This week I did two speed workouts. On Tuesday I did my standard interval workout, with 7 minutes of riding hard, trying to get my heart rate into the red zone, followed by 3.5 to 4 minutes of easy recovery. I repeat that 4 or 5 times. Since this is a circular course it somewhat eliminates the affect of wind on the totals. This table shows a summary of how I did compared with prior times. On Tuesday I had rode 84 miles the prior day and ran 6 miles that morning before the interval workout and it shows. Flat Loop Hecker Pass, Watsonville Road, Santa Terres. Today I did a very fast paced ride of moderate distance. After doing a couple mile warmup, I ride a 38 miles course with a combination of flats, hills and rollers, with a total climb of 1500 feet. I vary my effort along the course, attacking the hills and rollers. 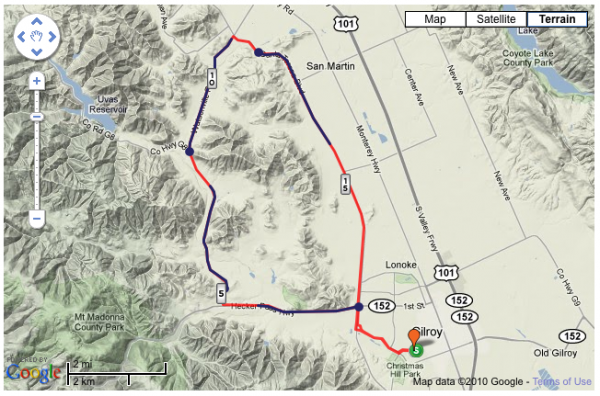 I was able to get my average speed up to 17.5 mph, about as fast as I have ever done this course in a time trail fashion. The third type of speed workout I will be adding in is hill repeats. I have a hill that takes about 7 minutes to climb and about half that long to descend. I do 4 to 5 repeats, climbing as fast as I can, then recover on the descent. The goal of these type of speed workouts is to increase your lactate threshold so you can go faster in an endurance event. If you can finish faster, with the same level of effort, it is much easier on your body. I plot out my training program, showing my actual values against my plan and also compared with training for some similar events. I track the longest weekly ride, weekly climbing, weekly total miles, accumulate miles and accumulated climbing over the training program. These are some of the charts. After 6 weeks into the training plan I am on track but the tough training is yet ahead. While most cyclists might dread the hills, I seem to be the opposite. When I am with a fast group of guys I can barely hang on, especially if there is a headwind. Once we reach the hill, my heart rate will actually go down and I may even go ahead of much of the pack. In trying to understand why this is the case, I have calculated the power requirements. If I had a power meter, I guess I could measure it directly, but calculating it will work fine. I am short and relatively lightweight. I would like to compare myself to a bigger guy, say someone who is 6 ft. 2 in. tall and weighs 200 lbs, compared with my 5 ft. 6 in. and 140 lbs. I have run the power required on different situations and put them in a table below. I will assume a 20 lb. bike in both cases. To make the comparison easier to follow, let’s assume both riders can climb a 10% grade at the same rate, and that rate is their maximum power output. If we calculate the power required for each rider to accomplish this, we can then see how much reserve power is left for different scenarios. If we are riding together on a flat road, with no wind, at 23 mph, I need to put out 91% of my maximum power output, while Mr. Big only needs to use 73%. If we now have a 15 mph headwind and travel at 15 mph, I have to increase my power to 96% of my maximum, and am dying trying to keep up. Mr. Big only needs to go to 79%. We know that human physiology is not linear and the closer one gets to their maximum ability the harder it becomes to achieve even a small increase in output. Of course we could look at things a bit different. Using the above table, let’s say both riders, traveling at 15 mph with a 15 mph headwind (on Malech) are putting out 95% of their maximum capacity when they hit the hill with a 10% grade. In that case I would be able to climb at 8 mph by putting out 100%, while the big guy will have to drop his speed because his 100% would be 315 watts which means he can only climb the hill at 6.7 mph. If the hill is Metcalf, which averages a 10% grade, that means I can reach the top in 13:20 (about my PR) but Mr. Big will need 16 minutes. Now you know why I hate flats and love the hills.